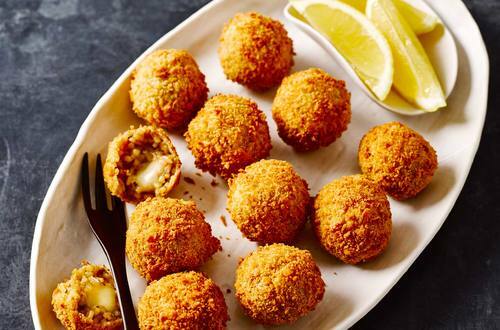 Impress your family and friends with these deliciously crispy Arancini Balls. Just don’t tell them how easy they are to make! 1 Cook Risotto as pack directions using water and Flora. Spread out onto a tray or large plate and allow to cool completely. 2 Using wet hands form Risotto into 8 balls each with a cube of mozzarella in the centre. 3 Coat each ball in egg then breadcrumbs. Deep fry until golden and heated through.